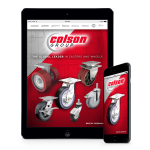 Colson Caster Corporation, the world’s leading manufacturer of standard and custom application caster and wheel products, has added new features and expanded the attributes of its popular 2 Series selection of stainless steel casters. The casters have been expressly designed to fit even greater customer demands for use in the most harrowing and tough environments. Responding to requests for an even more rugged and flexible design, the caster line also endured a complete battery of Colson’s own creative and brutal in-house testing to simulate its customers’ on-site conditions. The 2 Series stainless steel casters are built to withstand the most challenging environments such as laboratories, meat, poultry and seafood processing, and dairies and manufacturing sites. The entire caster and its component parts are made from polished 304 grade stainless steel. The 2 Series fork assemblies have a double ball bearing raceway for greater durability. In addition to its durable construction, the expanded caster line is available in swivel, rigid, and brake models. The series has always offered Colson’s patented Tech Lock brake but will now include the new Top Lock and Total Lock brake choices. Total Lock brake and swivel models are newly available with a ½” hollow rivet to accommodate custom mounting options. The casters all contain “Colson 45” the company’s multitemp grease for top performance even in the most extreme hot and cold temperatures. With maximum load capacities up to 325 pounds, the 2 Series selection from Colson are available in 3, 3 ½, 4, and 5 inch models and all are available for immediate shipment.